Overview: Jack and Annie are! They are trying to get a special feather that will help save Merlin’s baby penguin, Penny. 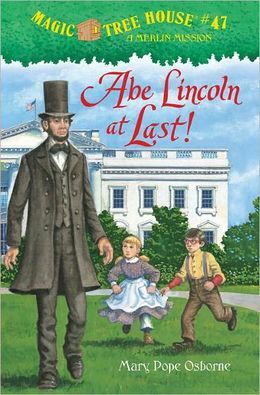 When the magic tree house whisks them back to Washington, D.C., in 1861, Jack can’t wait to meet Abraham Lincoln himself! But the new president is too busy to see them, as he is desperately trying to save a nation in crisis. We actually listened to this book on our recent road trip to Memphis for Spring Break. Both kids enjoyed listening to Mary Pope Osborne read her books.